Happy Happy First Weekend of October. Do you have big plans? We're making our first batch of pumpkin chocolate chip cookies, going on a pumpkin hunt, treasure hunting, and relaxing. I've found that I am a very needy pregnant lady. Nothing makes me happier than a trip to the grocery store to pick out fruit and to get secret surprise treats from my husband. 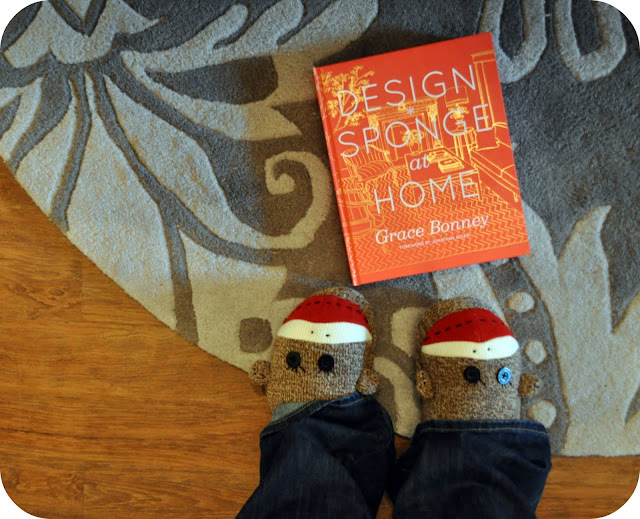 Daniel surprised me with these sock monkey slippers (for my sore feet) and this new book, Design Sponge at Home (to inspire me) this week. I plan on living in these slippers, especially since all of my shoes are too tight. My sweet sweet husband also ordered a pair of pregnant lady tights so I can make it through all three hours of church without having to go home early from stuffed sausage syndrome. This needy pregnant lady is feeling very well cared for. Thank goodness for sweet husbands. I owe mine big time. p.s. Bono Baby picked a winner for our giveaway (via Random.org). Felicia Dear, you are the lucky winner. Keep an eye on your mailbox sweet friend. Ha ha ha. Stuffed sausage Syndrome-- I love it! Dan is a good man. I'm glad you are getting the royal treatment. You deserve it. Put those feet up and let them rest awhile. Good man, Dan! Of course he is taking terrific care of you! Ohhh...the feet! I was working at the Grand downtown and I finally had to tell my boss it was either flip flops or slippers, I couldn't wear regular shoes anymore!